Rope Dyeing is considered a superior dyeing technology where the dyeing uniformity achieved is better than other Indigo Dyeing technologies like Slasher Dyeing. However, Rope Dyeing is a also a more difficult dyeing technology. One needs to master its nitty gritties to get the best out of the system. I , recently came across a very well written article on Rope Dyeing and thought it appropriate to share here. 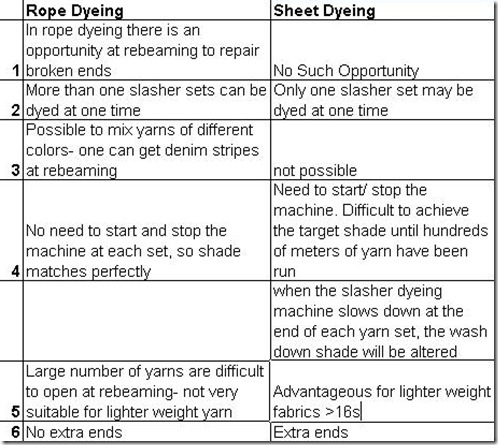 The article mentions in great details the technical points to be kept in consideration while using Rope Dyeing..
Read on only if you are very technically oriented ! * Tension at Ball warping should be less by 7-8% of single yarn strength. *The sensitivity settings for neps is set at +280 for rotor spun yarn and not +200 as in case of ring spun yarn. The reason for this is that the structure of rotor spun yarn is intrinsically different from that of conventional ring spun yarn. Neps in rotor yarn tend to be spun into the solid yarn body rather than remaining on the yarn surface, which is typical of ring spun yarns. Although embedded in the yarn core, these neps still represent a short mass defect and will therefore trigger the imperfection counter upon exceeding the preset value. However, compared to neps that are attached to the yarn surface, fully embedded neps are barely perceptible for the human eye. Thus, in order to balance the typical visual appearance of rotor spun yarn with the imperfection counts, +280 sensitivity setting is a common convention for rotor spun yarns. in 6th dye bath. We take H2O2(30%)+Acetic Acid(2:1 by weight). H2O2 acts as an oxidising agent. But as it acts on neutral pH (=7) and after cold bath the solution is slightly alkaline, to make it neutral wil add acetic acid. Acs in alkaline pH, oxidising action of H2O2 will be similar to the bleaching action, which may cause tendering in the fabric. Which tenders the yarn. Now at acidic pH reaction is much faster. So we add only a small amount of softener (25 gpl) as against that in indigo which is 100gpl. 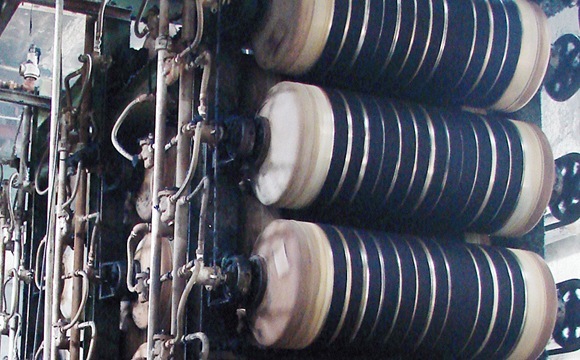 Over all during sulphur dyeing and storing, the yarn strength is reduced by 15% as compared to Indigo. If ball formation takes place of sulphur dyed warp at loom shed, then we can taken in 4th dye bath little Na2S+Caustic to reduce the free sulphur. 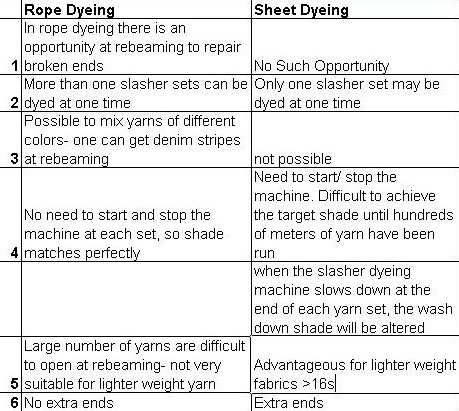 Technical Considerations in Rope Dyeing for Indigo dyed Denim. Caustic Soda: Its quantity depends upon the quality of cotton fibres used in the mixing. Generally we take 2-4% of caustic soda. It removes the wax by the action of soapanification. Sequestering Agent: Even with the use of water softening, it is very difficult to find the desired softness in water ( about 2-3 ppm) . So we use the agent to make the water soft. In 1 kg of yarn, there is approximately 2 litres of air. 1 litre of air decomposes 1.8 litres of Sodium Hydrosulphide. It will cause uneven dyeing and more consumption of Sodium Hydrosulphide ( hydro). 5. Absorbency of yarn may be checked after scouring. As some caustic is carried by the yarn after pre-scouring, so hot water is given at 70-800C. If this is not done, this yarn will go into the dye-bath which will change the pH of the dye-bath. After hot wash, yarn temperature is more. To bring it back to its room temperature, cold wash is given to it. 1. Indigo is not a perfect vat color. It may be called a trash vat color. The constant of substantivity for other colors is 30, for indigo it is only 2.7. So there is a need of 5 to 6 dye baths and make the use of multi-dip and multi-nip facility to increase the penetration. 2. The dyeing is done at room temperature as indigo belongs to Ik class of vat dyes, where dyeing is done at room temperature and oxidation is done by air only and not by chemicals. If oxidizing agents are used, they will cause stripping of colors. 3. Indigo is not soluble in water. So it is reduced with Sodium Hydrosulphide. Then caustic soda is added to make sodium salt of vat colors to make it soluble. To reduce 1 kg of Indigo, 700 gms of sodium hydrosulphide is required. However some extra SHS needs to be taken to avoid some decomposition of SHS. a. If it is used after 6 months, there will be a decomposition of sod. Hydrosulphide. It will become partially soluble. Then to make it soluble again, more SHS has to be added. So we can determine the rate of feed of indigo. It is very important that replenishment of indigo is there as any variation will result in the change of shade and also if level is more, there is a problem of over-flow. 6. If total capacity of dye bath for example is 15000 litres, then circulation must be 3 times the volume. If it is less then there are 100% chances of getting a lighter shade. 8. pH of the Dye bath should be kept in between 10.5-11.5. At this pH , sodium salt of Indigo is mono phenolic form. At this form, the strike rate of dye is very high. So after washing, there will be a better dye effect. At pH 11.5 to 11.7, at this affinity is less, so dye effect will be less prominent. pH is controlled by the addition of caustic soda. We take 10 ml of indio with SHS in 30-35 ml of water. It is set for one minute and shaken. As air will decompose SHS. So vacuum created will fetch the water from above. If 3 ml of water is required, then concentration of hydro is 3 gpl. As a thumb rule, concentration of total hydro should be min. 1.5 gpl. It is the hydro that is used for the reduction of Indigo. It should be around 0.7 ( 1000 kg of Indigo needs 700 kg of hydro to reduce it). For testing we take 10 ml of dye solution and 30 ml of water and 5-6 drops of 40% formaldehyde and shake it for one minute. The water that goes gives the readings of the reduced hydro. 10. Also hydro reduction capacity is measured by mV meter which measures the Redox Potential. Through the day, the redox potential should be +- 20 mV of the norm. If it is more then the process control is a failure. Caustic–> It is around 0.4 to 0.5 times the hydro used. Rubbing fastness of indigo is very important. On a scale of (1-4), it is 2. Washing is done to improve the rubbing fastness. 1. The rope is going to be opened at Long Chain Beamer. It the softener is not used, opening will be hampered. 2. It is generally 1.2% of the weight of the yarn. It is a cationic softener. It is always having pH in the range of 4 to 55. Softening is done at room temperature. If high temperature is used there is always some chance of tendering of yarn. 3. Concept of Buffer pH is given by Virkler USA, they say by addition of this, there is 40% less consumption of Indigo for same shade depth. Indigo can be further developed into Halogenated derivatives and sulphonated derivatives. Halogenated derivatives give better fastness properties and brighter shades, whereas sulphonated derivatives gives a soluble blue dye, good dye and is applicable on protein fibres. Although indigo is a vat dye, it can be regarded as a ‘trash’ dye, the dyeing and fastness properties are in no way comparable to other class of vat dyes. It is due to these properties, that make it an excellent dye for denim. The on tone fading and the bleach down properties of indigo blue has generated a lot of denim jeans fashions like stone, ice faded looks, etc. These special effects cannot be simulated by the other classes of dyes. 1. Vatting temperture should be as close to room temperature as possible. 2. Stirring should be minumum, unnecessary stirring affects the stability of reduced vat. 3. Volume of the reduced vat should be kept constant for every stock vat batch, as the constant volume will ensure a constant replenishing amount. It is measured by vatometer. It should be from 1.5 gpl to 2.5gpl , or by redox potential of dye bath which should be from -730 mV to -860 mV. Low Indigo Concentration –> Shade is dull and Red. Longer the dipping time, better will be the penetration and lesser will be the ring dyeing effect. It varies from 15-22 seconds. High pressure will lead to lower wet pick up and result in lesser color and better penetration. At rope dyeing, squeeze pressure is 5-10 tonnes, ie. wet pick up is as low as 60%. Hardness of squeeze roller is about 70-75 deg. shores. It sqeeze rolls are too hard then there are chances of slippage and uneven yarn tension.. If squeeze rollers are too soft then shading will occur. Surface of the squeeze rolls should be ground twice a year. It should be 60-75 seconds. 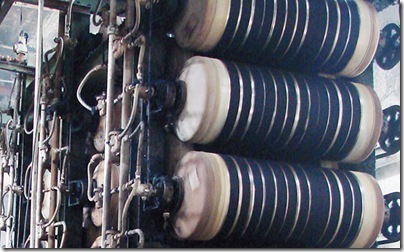 Longer airing time results in high tension on the yarn and subsequent processes will become difficult. At pH of 10.5 to 11.5, there will be formation of more monophenolate ions, which lead to higher color yield, as strike rate of the dye to the yarn bundle is very high, and wash down activities will be very good. At pH higher than this, dye penetration will be less and wash down characteristics are also poor. Pipet 10.0 ml of vat liquor into 100ml of distilled water in a 150 ml beaker. place under continuous agitation and insert the electrodes of a pH meter caliberated at pH 7.0 with standard buffer solution. Add 2 ml of 37% HCHO to 150 ml beaker. Add 2 ml of dye range liquor . Add 6 ml of 25% glacial acetic acid solution prepared by diluting 1 part acid with 3 parts water. Add 2 ml of starch/KI indicator. Add ml of water. Titrate with 0.046 N ( prepared by diluting 460 ml of 0.1 N Iodine to one liter ) solution until the color changes from emarald green to bluish purple. The clearest shades with minimum reddish streaks are observed at by relatively high conc. of hydrosulphite. On the other side, with lack of hydrosulphite, the leuco indigo is less dissolved and thereby adheres to a greater extent to the fibres. With lack of hydrosulphite furthermore, the amount of unreduced dyestuff by oxidation at the upper level of the liquor and through activiation of unfixed dyestuff, gets separated from the fibrous material would constantly rise as the reducing agent for creating leucoform would be missing. Under these circumstances a reddish bronze like shade results due to dispersion of not reduced dyestuff in the yarn. The min. proportion of hydrosulphite should be around 1.3 to 1.5 gpl in case of rope dyeing and 3-4 gpl in case of sheet dyeing. Also to avoid the lack of hydrosulphite or Indigo at certain places in the immersion, vat, the whole quantity of the liquor should be circulated 2-3 times every hour. At very short reaction time, an adequate liquor exchange ( i.e. the amount of chemicals consumed and replaced by fresh addition of reduced indigo) is not assured. This has a negative influence on dyeing and depth of dye penetration. In addition to this the time available for diffusion of dyestuff until oxidation commences is too short. To ensure an even and good depth of dye penetration by dyeing in several passages, the reaction time should be 20-30 sec. for each vat (eg. at a speed of 20m/min for a reaciton time of 10 seconds, the immersion path should be maximum 3.3 meters). A reaction time exceeding 60 seconds should be avoided as the amount of dyestuff again get reduced and released may again supersede that of additionally take up dye stuff, resulting in higher shades. Drying: Rest humidity should be 30% and then sized. For 12 ropes, at 24 m/min, of 344 ends of 14000 m length of 7s count. g. Make the solution to 1000 l by adding water. If pH is fluctuating, if it is > 11.7 then hydro is added (2-3 kg), if (<11.2) then caustic is added. 7 For All Mankind – First Ever Warehouse Sale.. Get Ready !